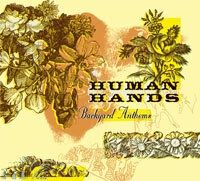 Backyard Anthems is the first full-length set of Human Hands studio recordings ever. Ten tracks in a wide range of musical styles, including power-pop, psychedelic-pop, Glam stomp, and our set-closing staple, "Happy Ending." 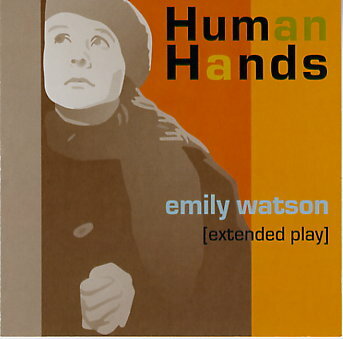 Emily Watson Extended Play, our first new recordings in 25 years. Released in 2004, this four-song EP was produced by the legendary Paul Cutler and showcases the bands wide range of musical styles from punk to pop to power ballad. High-quality Hanes Beefy T, size Large. High-quality Hanes Beefy T, size Extra Large. 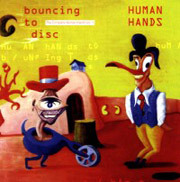 Bouncing To Disc is Volume One of The Complete Human Hands vintage recordings anthology (Vol. 2 still to come). All tracks date from the bands first incarnation, circa 1978-1981. Eighteen cuts, both studio and live recordings, including the classic singles Trains vs. Planes‰ and Jubilee.‰ Other highlights include New Look,‰ and Dilemmas‰ (both staples of the current bands live set), Upside Down,‰ I Got Mad,‰ Stupid World,‰ and many more. This December 1979 recording from West Hollywood's legendary Starwood club is the only known visual document of the original band's live show. Sound and video quality reflect the nature of the show and the times. Total run time: 35:43. 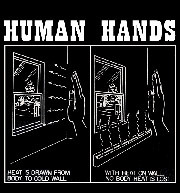 After the first incarnation of Human Hands broke up in 1982, many of the band members went on to join other groups. 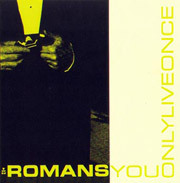 Juan Gomez formed The Romans with Michael Uhlenkott and Keith Mitchell of Monitor. You Only Live Once is their first album, a masterpiece of surf/punk/alt-country/psychedelia. In addition to the original album's 13 tracks, includes eight bonus tracks.